Butternut and acorn squash were much loved by all three of my boys. 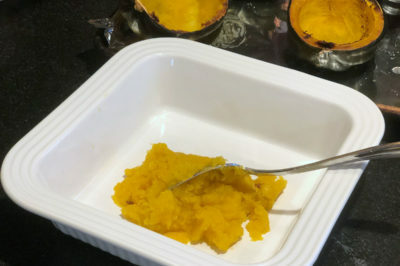 Whenever I cook it, I think of my grandma, who always had butternut or acorn squash at the Sunday dinner table, no matter what the season was. Food is not just to nourish the body—it can help nourish the soul, too! Age and Stage: 6 months+ | Stage One | First Foods and Beyond | 6 hours cooking Butternut and acorn squash were much loved by all three of my boys. Whenever I cook it, I think of my grandma, who always had butternut or acorn squash at the Sunday dinner table, no matter what the season was. Food is not just to nourish the body—it can help nourish the soul, too! Wash and halve the squash. Remove the seeds and peel away the shell. Dice the flesh. Transfer the diced squash to the slow cooker and add the water. Cover and cook on low for 6 hours. Check after about 3 hours and add more water if needed. 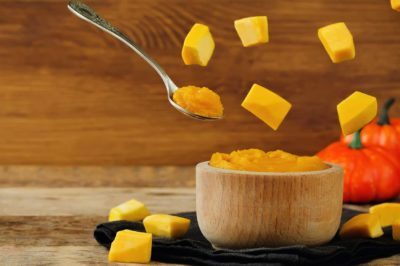 The squash will simmer down to a very smooth texture as it cooks, so you may not need to puree it for your baby. If so, set aside a portion or two for baby’s meal and feed after the squash has cooled. 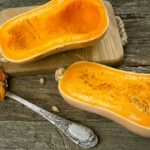 If necessary, place the squash in a blender or food processor and process to a texture that is appropriate for your baby. Add water, formula, or breast milk as desired to create a thin puree. Store in the refrigerator for up to 3 days for babies or up to 6 months in the freezer. 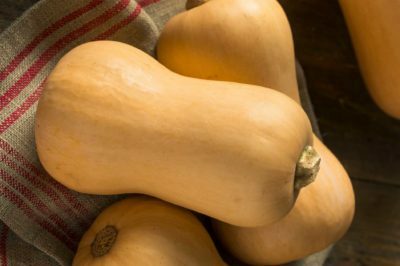 Add butter, ground cinnamon, and a bit of vanilla to the extra squash for a tasty side dish that goes well with any main entrée. If soup’s on your mind, take out a saucepan and add 3 cups (710 ml) of chicken or vegetable broth and 1 1?2 cups (380 g) of cooked squash. Whisk together and warm on the stove-top. Dish out squash soup and top individual servings with a dollop of sour cream.